Stuart Jones, Jr. - CEO, Sigma Ratings Inc.
Mark Rosenberg - CEO and Co-Founder, GeoQuant Inc. Please welcome your moderator for things that will blow your mind. Moderated by Accenture's Chief Technology Innovation Officer Paul Dharti. Good morning and thanks for joining us this morning at the things that will blow your mind. Session we're hoping to blow your minds this morning. As you just heard the chief technology officer in chief innovation officer of a company called Accenture and also just wrote a book called human plus machine which is looking at the impact of artificial intelligence on our relationships with machines and artificial intelligence and how that's changing our interaction and in writing the book and in my role at Accenture I get a chance to unfortunate to see a lot of cool things interesting things innovative and disruptive things that are happening all around the world. And the things we're going to talk about today though I think are taking this to a next level we're going to really look at some innovators and Trump and others who are bringing a really different viewpoint to solving some some really big problems. 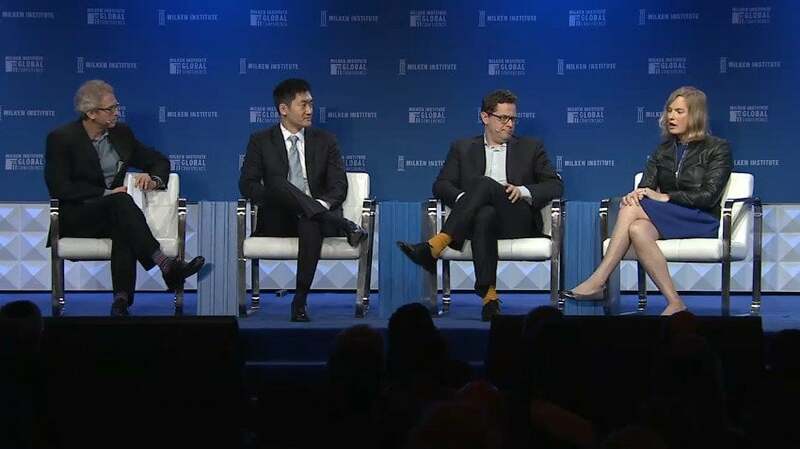 And if you think about this event the Milken the Milken Global Conference here that we're at it's a great event lots of big ideas tackling the world's big challenges. I'm sure many of you have already been at sessions looking at health impact of health care what's happening what the future is looking at transportation many many many different topics. But you know if you look at the overall theme this year navigating a world in transition you know navigating a world in transition is what we see as the theme. And I think the biggest transitions are certainly one of the biggest transitions that's happening right now is the revolution that's happening in technology and science and it's really a massive revolution. If you think about it we're in the early stages of this revolution which is driven by you know roughly the 70 years that we've had of innovation starting with silicone and semiconductors moving onto data algorithms artificial intelligence and everything we're talking about today. And this really is changing the way the world works and lives in a very fundamental way. And if you talk about blowing your minds think about somebody from a hundred years ago that showed up here today in the kind of experience they would have it would blow their minds to see what's happening now to see some of you holding up your phones and taking pictures and talking to our phones and all the kinds of things we take for granted now and that's what we're going to talk about today is setting the stage for what's coming next. And it's not a hundred years because the pace of technology is accelerating accelerating fast. So think about you know even what's happened in the last 10 years. I see a number of you with your with your phones out there. This is only a little over 10 years old. The smartphone itself you know it's something we take for granted now how many of you checked your smartphone the first thing before you get up in the morning before your feet hit the floor. Last thing before you go to bed. Raise your hands if you're not. I'm not sure he's owning up to it. 68 percent of 68 percent of you checked your phone before you know before you go to bed and before your feet hit the floor in the morning according to a recent survey and the average person in this room if the surveys correct touches your phone. Two thousand six hundred and seventeen times a day. So 2600 is 17 is about double that if you're a millennial. In the end the impact of this is that this thing is becoming indispensable or is indispensable. But I'd argue in the next 10 years we're going to that's not going to be indispensable anymore we're going to move on to even more mind blowing and disruptive technologies. It'll be about AI fueled virtual agents that become our friend and teaming partner helping us in a much less or much more much more transparent way solving our needs. It will be about new technology. Think about maker technology to the DIY revolution that's happening with 3D printing. Nadia Meqdad new manufacturing and things like that making things differently we'll hear about this a little bit today. So what is an example in a world where I can 3D print protein that looks like meat even if I'm a bacon cheeseburger loving person like myself. Well it seem foreign. And will it be acceptable for us to be eating meat from animals in a number of years. Those are the kinds of questions and opportunities that lie ahead.